There’s my feet– literally – today. Oops! focused on my tattered 100% wool trench coat. It wasn’t tattered when i picked up for $2 at a second hand shop some 4 years ago. Probably 60 plus years old, but still good. Have been shopping for a ‘new’ one since it’s practically ruint from snagging on brush I’m clearing. 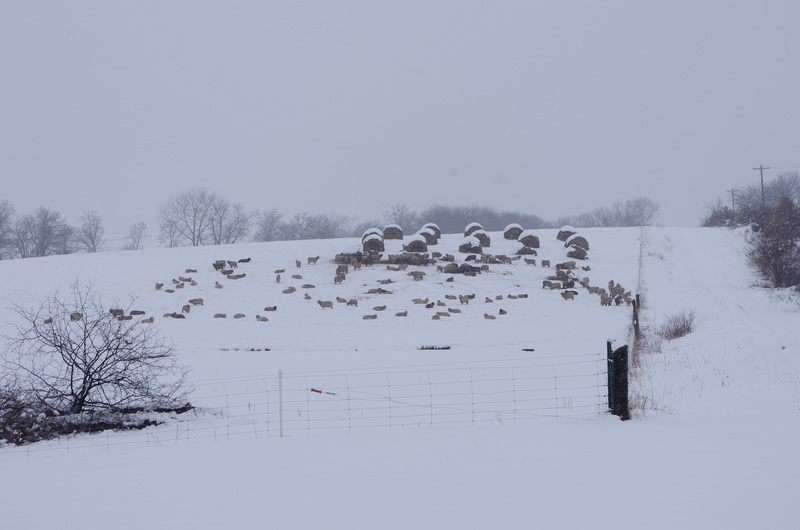 Cold, blowing, gusting northerly wind making it feel like 12F (-11C) at best- deep snow bottomed out by 2 inches of mud – i trudged/hiked nearly 3 1/2 miles (round trip) to shift my cows to a paddock with fresh stockpile which they would need to fill their bellies in advance of the bitterly cold temps to come this week. Glancing up occasionally to verify my position resulted in shards of blowing snow to my eyeballs. Goggles would have been a good choice today! Too muddy and snowy to drive in any closer. Glad i had a trusty hickory shepherd’s crook to steady my steps whilst slipping around in rutted, muddy Cotton road. Took me 1 hr 20 minutes to make that hike back to the pickup. My hips were burning so badly, i could barely lift my feet above the snow for the next step – but step i must – there was no other option. Total time from leaving the pickup to arriving back – 2 1/2 hours. I certainly had my alone time for the day. One of the small creeks (cricks) along the way back. Sheep don’t even know it’s cold!